The first meadow we came to was in a ring of ponderosa pines. Grass damp from rain lay halfway to the ground. The forest hovered close. From the looks of the place — heavy woods intermixed with aspens in rolling hills and draws — we could have been anywhere from Alpine to the Mogollon Rim. Only, if you followed this meadow and its draw downstream, eventually it would narrow into a canyon before falling through the North Rim into the Grand Canyon. The North Rim isn’t a rim, not like the edge of a bowl. It is a ragged coastline, its many peninsulas reaching for the Colorado River. Shell-shaped bays are scooped from the wooded Kaibab Plateau, where a thousand square miles of ponderosas, aspens and oaks spill down draws and slopes and over the edge, trunks shattered where they fall into canyons thousands of feet below, as if timbering into the sea. In this grassy, cool meadow strung down the bottom of a draw, you wouldn’t have known the Canyon was out there. It felt as if we were in a forest that covers the world. The North Rim is dotted with gentle inland parks, narrow half football fields of ferns and lone aspens. A hawk will fly from an old-growth snag. You will walk into meadows, half a mile wide and decorated with eroding blocks of ancient limestone, where it feels as if you’re wandering through Middle-Earth. Late in the day, at a good place to drop camp, we left packs in the meadow and climbed out of the draw with a map in hand. It helps to get up high and see where you are. At the top, through thorny locusts and pine cones, we broke into an interior rim. We saw exactly where we were, the Canyon splayed like an anatomy lesson in front of us. Thrones and temples; Kaibab limestone down to Vishnu schist. Neither of the friends I came with had ever been to the Grand Canyon. It was a fault that needed fixing. I didn’t let them walk out to the easier points near the road that took us into the park. I wanted this to be their first view: climbing up a hill slope and suddenly looking into a Technicolor cascade of stone. They laughed in disbelief at what they saw: the Earth caved in on itself, an entire horizon laid bare. At least once in a lifetime, a person should gasp unexpectedly at the sight of the North Rim. My friends were initiated. You wouldn’t do this in a day. Three or four would be good. To come without a trail, I recommend approaching the North Rim slowly (years, maybe), becoming disoriented and finding your way back. With no kiosks, National Park Service signs or trails not made by bison or mule deer, you move half-mile by half-mile, scouting down one draw and up another. Another option: You could drive to the edge of the North Rim on a rough dirt road, drop a tailgate and have a picnic over the glorious maze of the Grand Canyon from about 8,000 feet in elevation. But if walking is your thing, and you know someone who can help you not become dismally lost, go by foot through the forest to get to the North Rim. It’s the proper way. This is the quieter side of the Canyon, front country and back. It’s farther from most civilized places and interstates. With a zenith of 9,200 feet in elevation, the Kaibab Plateau snows in every winter and the North Rim’s Grand Canyon Lodge, along with the road getting here, is closed. Trails are fewer on this side, views harder won. The South Rim is a thousand feet lower, putting you at eye level with the Canyon. What looks geologically inscrutable from the south, you can puzzle out from the North Rim — the difference between looking down on a labyrinth and looking across one. You want to believe there is a tip to every point on the North Rim, that you can walk to it and throw out your arms as if on the bow of a steamship. Some points end that way. Most don’t. Peninsulas crumble into limestone platforms and downsloping scree, thickets of locusts and gnarled, naked junipers left from wildfires decades ago. Draws that weave through forests on the Kaibab Plateau plunge into deeper and darker chutes until they launch over the Coconino palisades below, into the back of every massive canyon on this side of the Grand Canyon. The rim is where the forest ends and the planet opens wide, sky opening with it. We slept in the meadow, under swiftly passing clouds and light rain. Morning smelled like a terrarium: fern glens and fallen aspen leaves, pine needles holding clear drops at their tips. Quick breakfast and to the ridge along the edge of the Canyon, where we walked a skinny curve of land, the Canyon falling away to either side. This peninsula is nameless, like most of the long, forested arms on the north side. Burnt hulks of trees from fires decades ago stood like obsidian, a new forest sprung up around them. Our tents bloomed at the end of a mile-long arm covered in conifers, locust bushes and blackened trunks of old burns. For two nights, we didn’t move camp from that spot, each evening watching golden light fill the canyons around us. We walked in every direction, leaving and approaching our neck of a high point from different angles. We followed its benches high and low, plumbed its wooded drainages, split up, went alone and came back together in time for dinner. This is a way of learning a place: walking routes, climbing limestone escarpments, wandering among ponderosas. We scrambled out to rim views as much as we traveled back into the woods. The North Rim is both forest and abyss. You can’t grasp one without the other. One of my friends started with his tent as far out of the woods as possible, overlooking the Canyon. The next day, he sheepishly pulled up stakes and moved his tent back into the ponderosas. All night, he said, it felt like he was falling. There’s no water up there, not where we were. The drips and seeps you’d use to fill bottles were another several hundred feet down inside the Canyon, through timber crevasses and loose boulders where my friend thought he might tumble. Thinking I might find water along the rim, I went off alone one afternoon, tracing a draw to where bedrock was exposed. I moved through a narrow museum of trees and undergrowth where you don’t walk, but crawl, climb, step over, try not to step on. It’s moister along shaded corridors like this, where vegetation tumbles to the bottom. I wasn’t finding anything other than moist soil. Nothing we could drink. Under fallen gray aspens lay the skull of an eight-point buck, a deer with its antlers, grown vertically like a candelabra, still rooted to bone. It was one of the biggest mule deer I’d seen. A year or two dead, and once the proudest creature in these woods, it still had a bristled crown of head fur between the antlers. Sentinel, I thought. A reason to pause upon entry into the grotto end of this draw. If water was anywhere, it would be along a bedrock overhang. I climbed for it, and an owl startled me from its treetop perch in a mangled Douglas fir. Brindle-banded wings sailed overhead as it descended toward some other dim hole where it could wait out the day. That was my second sentinel. I was sure I’d find water. The route smelled like a cave: limestone boulders dappled in moss. It took me into a gaping bedrock mouth, the inside draped with maidenhair ferns, but no seeps to sip from. No water. I returned to camp empty-bottled. Cape Royal is a good start for the North Rim if you don’t have much time. Make it a slow walk. Pause at every gap in the trees that you can see through. The trail is paved and takes 15 minutes. Side trails in dirt and duff lead to abrupt edges. Don’t lean out too far. Sit on benches and boulders. Make an hour of it. Make it two. Learn how the place works by using your eyes, tracing the bottoms of canyons until they disappear into each other. Walk to the farthest point, with railings and travelers, from near and far away, all around you. Out on this limestone sea stack, stay long enough to sense a change in the wind as Grand Canyon air rises and sinks into the day. Stay until new waves of people arrive and leave, as shadows shrink and lengthen in the maze of temples below. If you have an evening after that, go out with the colorful throngs to Bright Angel Point, at the foot of the massively timbered Grand Canyon Lodge. Walk the paved narrows and, in a gap between passing conversations, listen into the Canyon below. If the wind is not high, you will hear the roar of water. It is not the Colorado River — too far away to be audible — but a spring creek plunging into a side canyon. It is the sound that gives magic to the Canyon. If you have another day, go for Cape Final, where you can look west into the arms of Marble Canyon and the great, banded palisades on the opposite side. Or a day out and back to Widforss Point, above a cruciferous layout of geologic faults and stone temples. Both of these hikes go through miles of woods, with rims glimpsed between trees — a perfect way to approach the North Rim. A backpack and a trail can get you farther. Start picking nameless rims on maps, and learn ways in and out, routes through the Kaibab and the Coconino, the top layers of rock in the Canyon. Day by day, decade by decade, you will see more of this rim: brilliant, golden October in the aspens; August rocked with thunderstorms, evening horizons prickled with lightning. Even if you don’t make it past Cape Royal, you will have understood something about the North Rim. We were too lazy to go over the rim looking for water. That would have been an expedition, and we were here on vacation, a few days with backpacks, mapping a bit of rim for ourselves. To refill our water for one more night out, we walked back to the truck with empty packs. The truck was parked among forested dells and an old, locked-up wooden shack at the end of a four-wheel-drive road. No trails go out from here; no signs or handrails. Most of the North Rim is like this. You could wander its draws and forested ridges for days and never see the Canyon. At the end of the day, coppery light falling into meadows, we moved through timber cuts that must have been half a century old. New trees, a full head of ponderosas, had grown back in. A meadow lay wide open, ferns elbow-deep, bison dung dropped like stones where old growth and first growth once were cut — remnants of an old forest. The largest of the trees had been toppled, its length sawed into rounds ready for transport, but it never left, as if lumbermen saved this giant for last and cut it down to say it was done. The whole thing lay in sections, 200 feet of ponderosa laid out like a derailed train. We walked into the end of the most beautiful evening we’d seen. It wasn’t a grand view off the North Rim, but a gentle valley filled with soft-leaf mulleins and late-day God lighting. We were back in the forest that covers the world, no inkling that the Grand Canyon might be half a mile away. 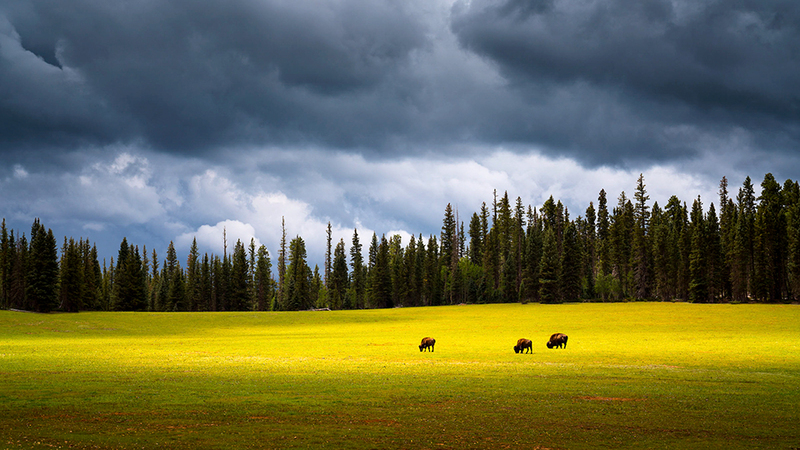 As much as the North Rim is a towering rift in the Earth, it is what grows all around, meadows and woods crowded in. It is the place not so grand, the woods that come to the edge of the world.